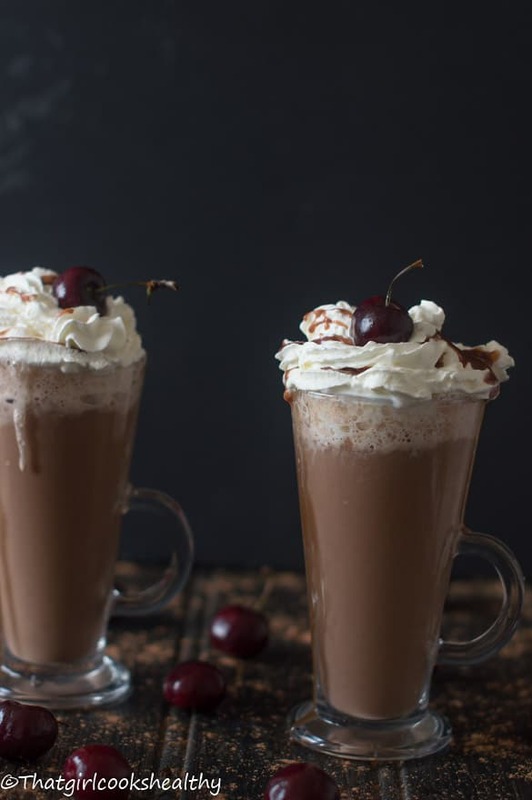 Cherry hot chocolate – keep your warm by cosying up to this delicious vegan cherry hot chocolate drink made from cacao powder and plant based milk. As the weather continues to decline in the UK, you will find me looking for various ways to stay warm. Anyone who knows me outside of the bloggingsphere (is there such a word?) knows that I am a certified professional cold dodger. I seriously HATE — written in capital letters to emphasize my disdain….the cold weather. 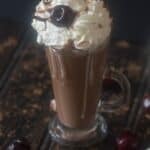 If I had my own way I would hibernate for the next 6 months with some cherry hot chocolate. While I don’t have the luxury of hiding from freezing temperatures, one thing I ensure to do is to make lots of lovely hot beverages. During the winter I am quite partial to some hot chocolate, you know the vegan kind without the cows milk (yum, yum). 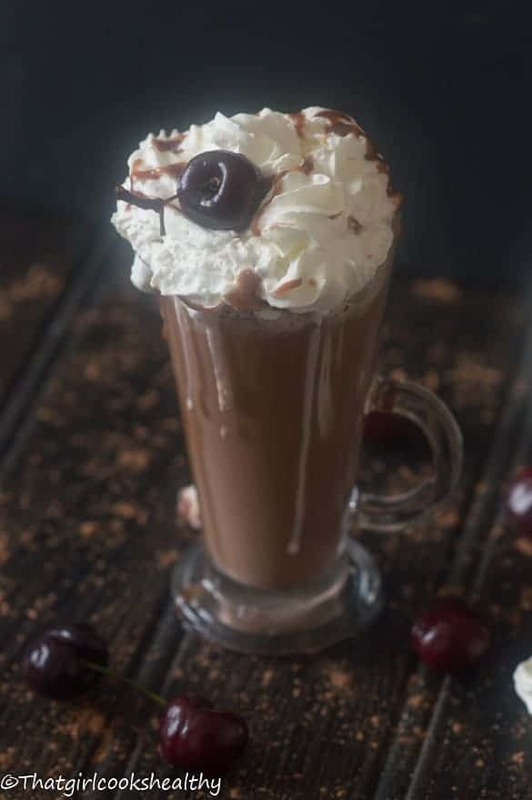 This orange hot chocolate that I made a few years ago was a hit with my readers. Just like a musical number one hit, when you strike gold the first time it’s a challenge to follow up with something equally as good. In other words, the pressure is on, your readers anticipate the next hot chocolate recipe hit. 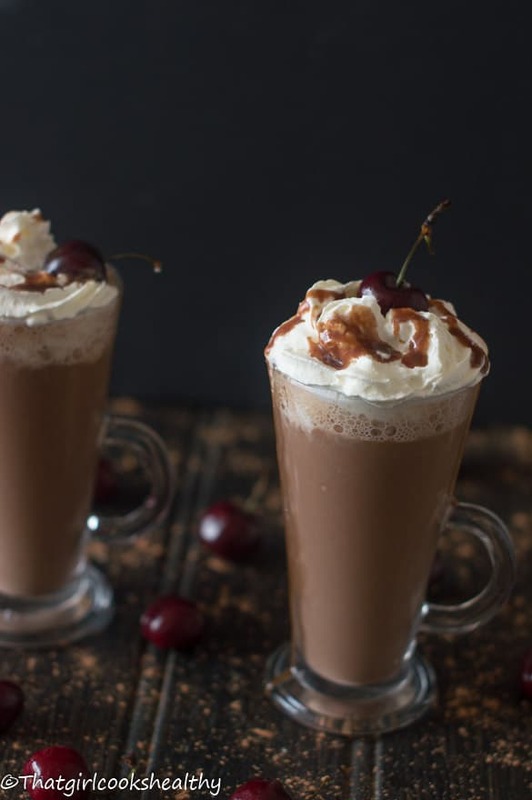 Fast forward to a year and a bit and BAM……there I go again with another dairy free hot chocolate. I love flavoured hot chocolate. 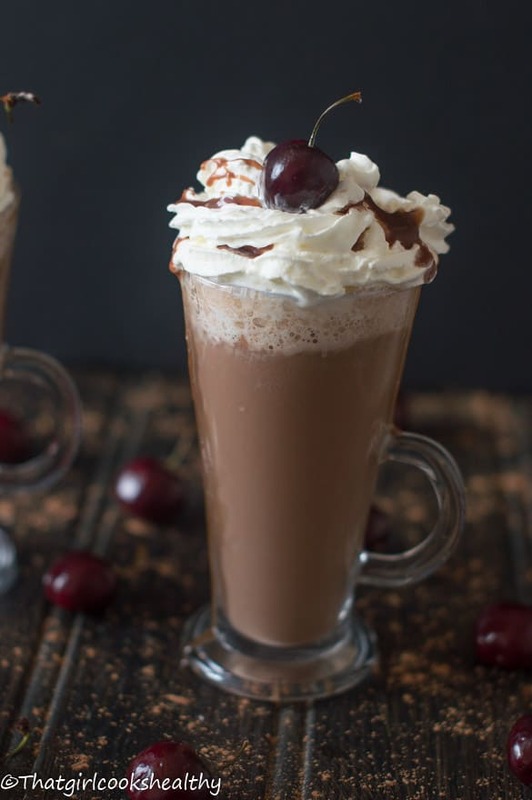 There’s been many trial and plenty of errors but this cherry hot chocolate is surprising good. Admittedly it look a few attempts to formulate the correct ratio of fruit to plant milk/raw cacao. Luckily the hard work has been done you, all you need to do is follow the instructions to a tee. You don’t need a large quantity of cherries or else the taste will be too overpowering. About 8-6 pitted cherries are suffice. This will offer a subtle cherry flavour to the cacao and milk. In terms of sweetening, feel free to use some agave or coconut nectar to your desired taste. Cosy with a good book, or simply drink at your leisure the pleasure is all mine. Add everything (excluding the topping) to the blender and blitz into a smooth consistency. If using a vitamix continue to blend until the milk heats up then serve with the optional topping. If using a regular blender, once the milk is smooth then add to a saucepan and heat on low-medium heat for 3-4 minutes before serving. That sounds like a great combination! It’s like those chocolate covered cherries in drinkable form. And I agree that there is nothing like a hot drink to make the cold weather more bearable. Loving the analogy, yes it is very much like chocolate covered cherries in a drinkable form. 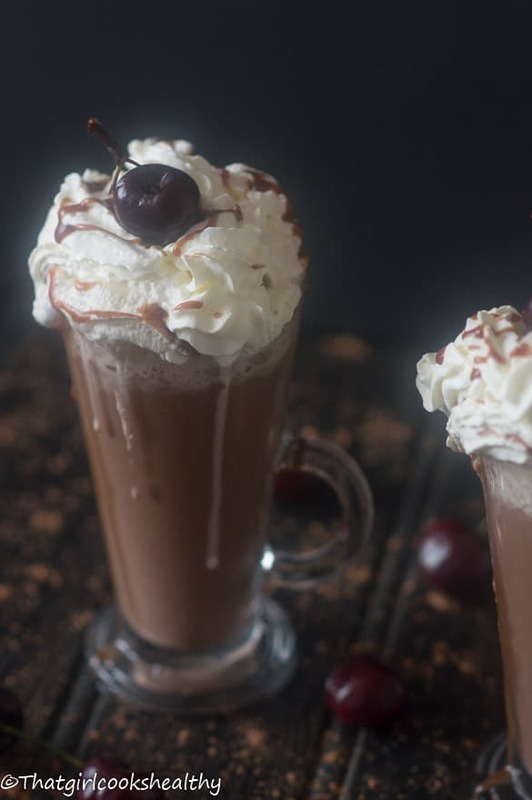 Cherry and chocolate is a match made in heaven! Throw hot chocolate in the mix and I’m in heaven. Love that this is a lighter (and vegan) version as well! Thanks Kara, a lot of people are hopping on the vegan wagon. Oh my. I need this right now! It makes me warmer just looking at this beauty! This looks SO good!! I love a good hot chocolate in cold weather. Love the cherry twist! Hot cocoa is a winter essential. Since I’m trying to cut down on my kids’ cow milk ntake, I love having this dairy-free alternative. I wonder if they’ll like almond milk or cashew milk better! Choices! Choices! Almond milk or cashew…both are complimentary! Yummm is all I can say looking at this pic. I am a vegan occasionally but always a vegetarian. Love to find such recipes which I can use in my diet.